As part of her gift to me, my wonderful maid-of-honor presented me with a stack of pre-addressed envelopes and corresponding thank you notes at my bridal shower. As she addressed each bridal shower invitation envelope, she also took the time to neatly write out the name and address of the guest on a matching thank you note envelope. I can't tell you how much time and effort this saved me when writing out my notes, I was actually able to focus on the note at hand instead of looking up addresses and writing out the envelopes. Her gift was so touching-- and a huge help during those busy days of wedding preparation! 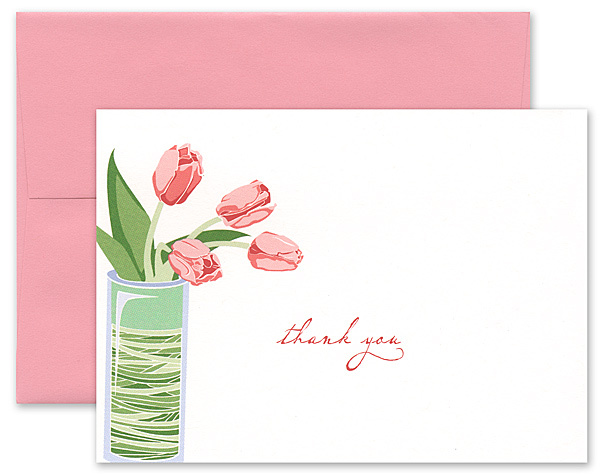 If you're hosting a bridal shower, consider giving your bride-to-be thank you notes that reflect her own personal style!